Present Owner: La Maison Gabrielle-Roy Inc. The house at 375 rue Deschambault is intimately connected with one of Canada's most important writers: Gabrielle Roy. 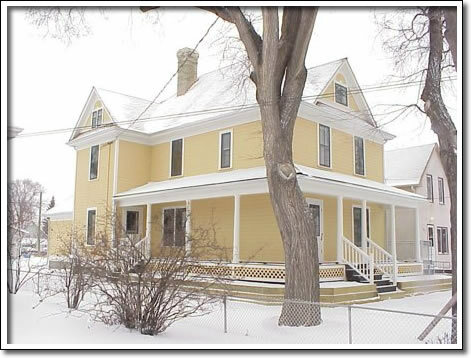 Gabrielle Roy lived in the house for a total of 28 years, from her birth (1909) until she left St. Boniface, and eventually Manitoba, to pursue her teaching and then her writing careers (1937). It was in this house, and in the St. Boniface neighbourhood, that many of the stories in her books were located. Her Governor-General's award-winning book Street of Riches (in the original French version, Rue Deschambault) is set very specifically at this house. The origins of the building design are even presented within the first sentence: "When he built our home, my father took as model the only other house then standing on the brief length of Rue Deschambault—still unencumbered by any sidewalk, as virginal as a country path stretching through thickets of wild roses and, in April, resonant with the music of frogs." Léon and Melina Roy, who had moved to St. Boniface from St. Alphonse in 1905 after Léon was appointed an immigration agent, commissioned Melina's brother Zenon Landry to build this house. Employing a common four-square design, the building was graced by the columned verandah that afforded the Roys and their nine children a welcome and commodious outdoor seating area.